Are you crazy about snow and would love for the ski season to never end? 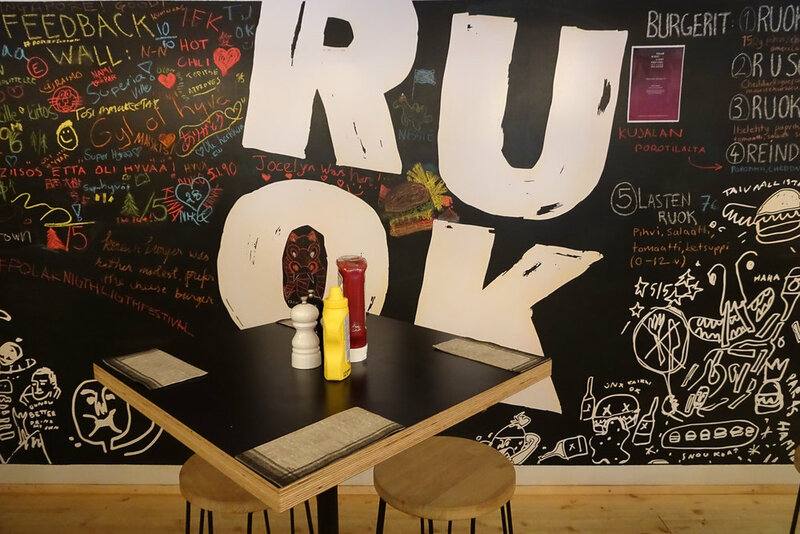 In this mini-guide, I'll tell you all you need to know about visiting Ruka-Kuusamo in winter - no matter whether you're planning on going skiing or would rather just like to enjoy the local Finnish cuisine! Where and what is Ruka-Kuusamo? The region of Ruka-Kuusamo is situated in Northern Ostrobothnia, in the north-east of Finland, bordering Russia. The area is located at 66 degrees North, so not technically in the Arctic but part of the Sub-Arctic and at least landscape-wise, a part of Lapland. While Kuusamo is a town of 15,000 inhabitants and a major centre of winter sports competitions, Ruka is one of Finland's most popular ski resorts. 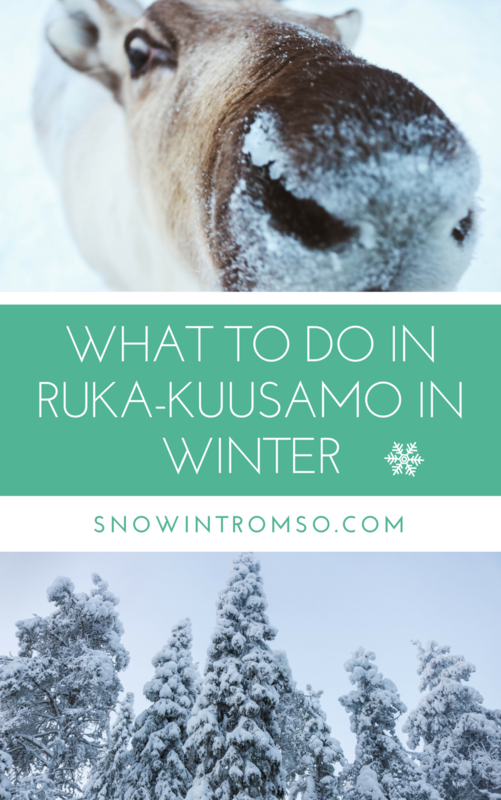 What to do in Ruka-Kuusamo in winter? Granted, this is to be expected in a ski resort like Ruka. Did you know, however, that Ruka has 34 ski hills and 21 ski lifts? The ski season in Ruka lasts from October to May - a white Christmas and Easter pretty much being guaranteed! I tried my hands at downhill skiing for the very first time in Ruka at the local ski school and even though I'm a long way from being a pro, I had an absolute blast - even in minus 20 degrees! If you'd rather try cross-country skiing, though: There are 170km of trails in Kuusamo and 89km in Ruka - plenty of those being lit as well, which will help if you visit in December when there are only 3 hours of daylight. Not your usual winter pastime and definitely not something for everyone. You can try ice-climbing in Ruka with Outdoor Passion Finland, just a stone's throw from the ski hills. At the 35m high Kuru Wall, you can challenge your inner Arctic warrior and beat the ice - and hopefully your fear. To be honest, I didn't make it very far up the wall. Picture one inch and you pretty much know just how far I made it exactly. Ice-climbing definitely requires some strength in your arm and legs, as well as no fear of heights. I definitely have the latter and lack the former but I admired everyone who made it further up than me! You can find more info about ice-climbing with Outdoor Passion Finland here . If you're wondering how Finns survive their long and cold winters, you should definitely consider spending a "Day as a Finn". Visit Santa's Cottage and bake Finnish bread, go snowshoeing or sledding and warm up in the sauna afterwards. 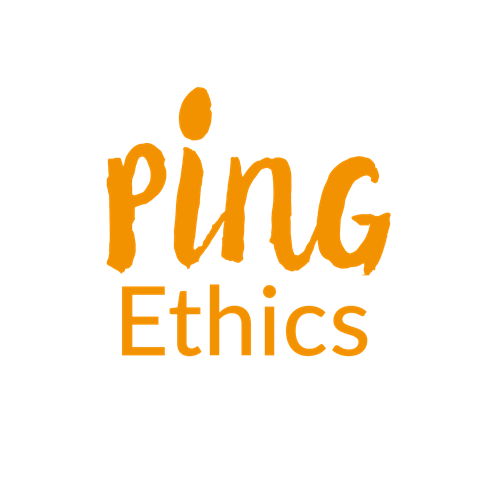 Learn more about the Day as a Finn program here. No visit to Lapland is complete without seeing reindeer! Whether you'd just like to see (and maybe cuddle with) them or go on a reindeer-sledding adventure, our visit to the Palosaari Reindeer and Fishing Farm was absolutely memorable. Did you know that reindeer love nothing more than moss? Hold it in front of your camera for the cutest snout pictures! You can find more info about visiting the reindeer at Palosaari here . There are 3 inhabitants living in Ruka-Kuusamo per square kilometre, ensuring plenty of wilderness and thus, game. 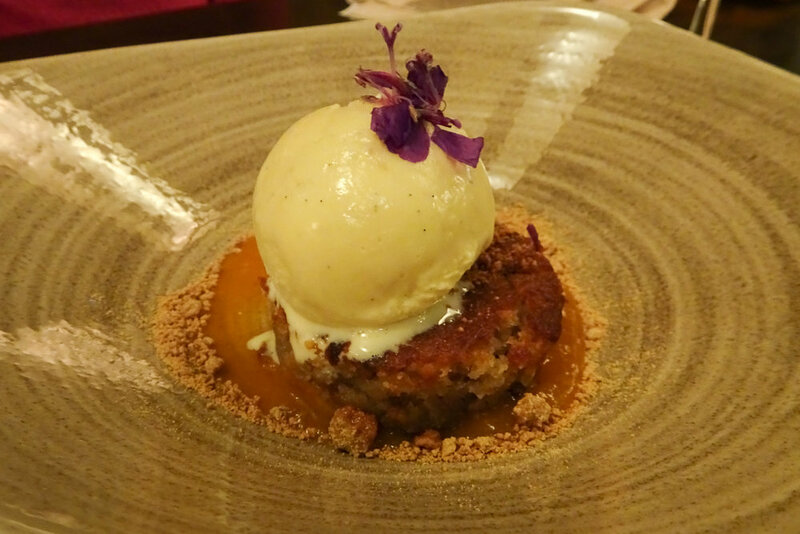 If you're a fan of meat and fish, you'll absolutely love the culinary scene of Lapland. We got to stuff our faces with burgers and fries at RUOK burger in Ruka - who by the way, also offer a yummy veggie burger in case meat isn't quite your thing. .
At Riipinen Wild Game Restaurant, I then got to try fried vendace for the very first time - a specialty of Finnish cuisine and a very crispy, albeit at first weird getting used to, appetizer. If you decide to eat here, definitely try the creamy forest mushroom soup and the Arctic char - or go for the reindeer filet, the moose steak or sauteed bear meat if you're a bigger fan of meat than I am. Last but not least, the Restaurant Rukan Kuksa is another great location if you'd like to have wild food. They have a nice selection of reindeer meat and fish, but more importantly (for my taste anyway), a nice choice of desserts and even a veggie main course option. 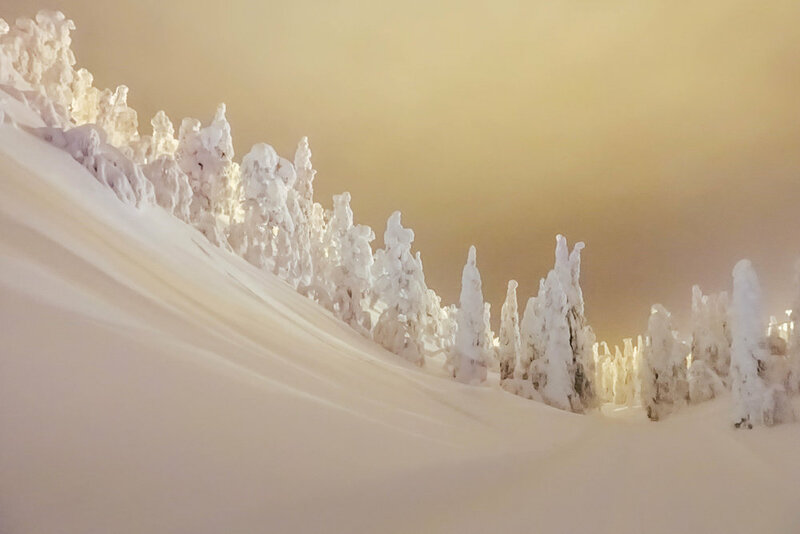 Oulanka is the biggest national park in the Ruka-Kuusamo region and offers plenty of things to do, from going on a snowshoe hike to cross-country skiing, to simply admiring the views or watching out for reindeer, moose, lynx and bears. You can find more info about visiting Oulanka National Park here . A visit to Ruka-Kuusamo, no matter the season, is about the outdoors. Don't worry about feeling exhausted after all that skiing, ice-climbing and snowshoeing though! A lot of the accommodation options in the area come with a traditional Finnish sauna and there even is a spa in Kuusamo if you'd like to fully relax. You can find more info about Kuusamon Tropiikki Spa here . How to get to Ruka-Kuusamo? Finnair operates flights from Helsinki to Kuusamo every day and the journey only takes an hour. Furthermore, Lufthansa arranges (charter) flights from Frankfurt to Kuusamo in the winter season, but you can also fly into Rovaniemi or Oulu and take the bus (or rental car) to Kuusamo from there. A cheaper, but arguably longer, way of getting to Kuusamo is by train or bus from Helsinki. For more information about train and bus schedules between Helsinki, Rovaniemi, Oulu and Kuusamo, click here . Where to stay in Ruka-Kuusamo? In Ruka-Kuusamo, you have your pick between log cabins in the wilderness or ski apartments. We got to stay at the Ski-Inn Hotel RukaVillage which was voted as the 4th best bargain hotel in Finland by TripAdvisor users in 2016. You can choose between hotel rooms and apartments of different sizes at RukaVillage and all rooms/apartments are equipped with a kitchenette and private sauna. The village is situated in the centre of Ruka and within walking distance of restaurants, pubs, several ski hills and the free shuttle bus to the ski school. For more information about and current rates of RukaVillage, click here . The coldest month is January with an average of minus 14 degrees and the darkest month is December with only 3 hours of daylight. The region is one of the snowiest in all of Finland, though, with an average snow depth of 60 to 75cm between January and March. If you decide to visit during the winter, you'll definitely need thermal underwear, plenty of woollen sweaters, scarfs, hats and gloves, as well as snow pants and snow boots. You can rent/buy most items of clothing and all ski equipment at the local ski store in Ruka if you don't have the option of bringing everything you need with you. Click here to read my packing tips for Arctic winter weather! CAN'T GET ENOUGH OF snow? WATCH MY latest Arctic videos FOR MORE OF THE GOOD STUFF! Skiing or cuddling reindeer - what would you most like to do in Ruka-kuusamo?